A young journalist has an unexpected assignment: to interview Paolo Levi, a famous violinist. Her supervisor cautions her on one thing: Don't ask the Mozart question. In the interview, Paolo opens up and tells the story of how he started playing the violin and how his playing unearthed family secrets. Both Paolo's parents were Holocaust survivors and the reason they survived was that they were musicians. Their playing saved them, but the fact that they were used to comfort new detainees as they got off the trains sickened them. It was an interesting story, based on fact. There were Jews that played music for new detainees. They played to save their own lives even though they knew that the people they were "comforting" were destined for hard labor or the gas chambers. I'm not a fan of this type of story, where the entire story is narrated by someone within the story. I think this smacks of a "children's book" that's really for adults and I wonder how kids will react to it. The art is certainly beautiful, but the book's not exactly a picture book or a graphic novel. I'd hesitate to call it a novel, though. Maybe an illustrated novella. I do think the topic has potential kid appeal. World War II and the Holocaust are both popular topics with kids and this story approaches a unique aspect of the Holocaust. And other bloggers disagree with me: 100 Scope Notes calls this "a must-have middle grade selection". This book just wasn't my thing. But I'm not the one voting in the Caudill awards! 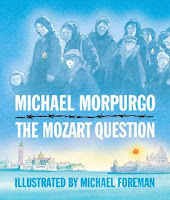 Check out Michael Morpurgo's website.